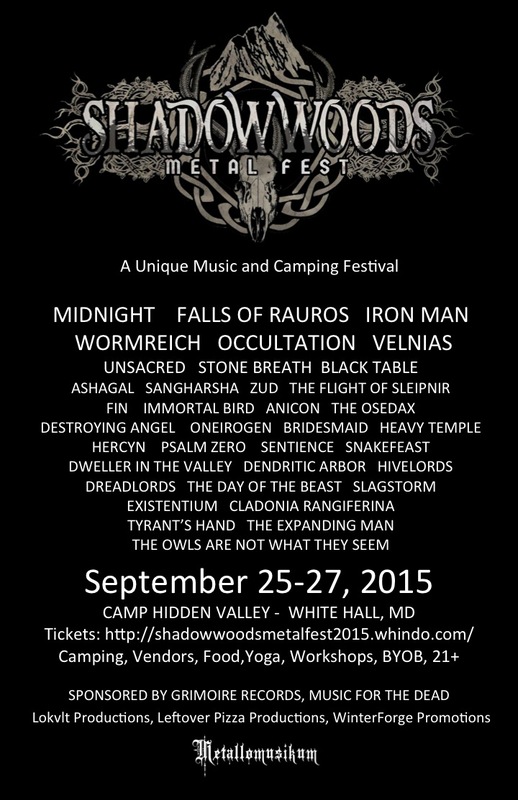 This September marks the first (and hopefully not the last) occurrence of Shadow Woods Metal Fest, a first-of-its-kind in the US mini-version of the Euro style open-air fests. The fest will be held in White Hall, MD about 30 minutes north of Baltimore. Thirty-six bands will perform over two days beginning September 25 and attendees can camp through September 27. We, that is the makers of Metallomusikum, have been working on this fest for more than a year with the help of a crack team that includes Lokvlt Productions from Philadelphia, Leftover Pizza Productions in Frederick, MD and WinterForge Promotions in Pittsburgh PA. Our sponsors are Grimoire Records, the hybrid recording studio and record label based in Baltimore, MD, and Music For The Dead, an independent label also from Baltimore that specializes as they say, “in music no one living would want to hear.” In addition, another dozen more friends and colleagues were recruited to help with things like security, food & beverage, vendors and sound/stage/lights. While every band selected for this curated list is outstanding, there are a few performances that should prove especially memorable. Headliners for Friday include Falls of Rauros, Occultation, Velnias and Immortal Bird. Headliners for Saturday include Midnight, Iron Man, Dweller in the Valley and Wormreich. Regarding Wormreich, this fest will be their first live performance since their fatal van accident on April 6, where they lost two band members. We have 12 arts vendors, including Poison Apple Printshop and Runk the Skunk Jewelry, along with several record distros/labels, such as Crucial Blast, Salvation Distro and of course, Grimoire Records. This fest will also have some workshops, which is pretty different from what you might encounter at other open air fests. Old Town Lutherie will teach a workshop in guitar maintenance, an expert in Scandinavian history and culture will present a workshop on Runes. And each morning different yoga instructors will hold sessions for those interested. Bring a mat and comfortable clothes if you want to try it out. There will probably be some other last minute surprises. Along with all this, we have two exclusive t-shirt designs and one beautiful art poster created especially for this inaugural fest. Only 350 tickets will be sold to Shadow Woods and no tickets will be sold at the gate. Repeat: everything is pre-sale. Don’t wait. When the fest is sold out, it’s sold out. And we fully expect it to. Our location is Camp Hidden Valley, a children’s camp on private property managed by the Harford County Boys & Girls Club. The landscape is beautiful and heavily wooded. There is plenty of room for tent camping, a huge dining hall where our vendors and one stage will be located, and men’s and women’s bathhouses with flush toilets, showers and running water. There are even outlets to charge your phone. Shadow Woods Metal Fest is 21+ and BYOB. You can read all about it on the fest website. See all the related links below. We will be featuring short write ups on the bands in this space and on the fest website. See you in September!